Hats are the only accessory that get their own fashion plates, which indicates how important they were to a lady’s wardrobe. If you browse through almost any of the other groups of fashion prints on this site, you will see that the bonnet typically gets as much space in the description as the dress. 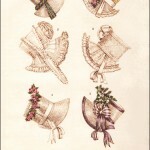 Hats were purchased at millinery shops, but could easily be modified and updated at home with new ribbons, lace, flowers, feathers, and other ornaments. 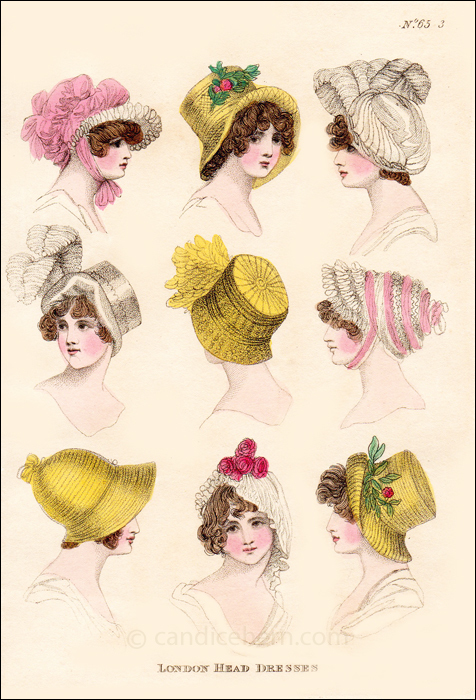 Hence the frequent publication of fashion plates of hats, especially in the less expensive publications, like this one, which would have provided the middle class lady with ideas on updating her bonnets and caps. “No. 1. A bonnet of pink silk with a white lace front, a full double crown finished on the top with a bow and tied under the chin with pink ribbon. “No. 2. A ribbon and straw hat, the ribbon in diamonds, and the straw in beads, turned up in front and ornamented with a flower. “No. 3. A turban of white satin and crape ornamented with a plume of white ostrich feathers. “No. 4. A hat of white satin trimmed all over with beads, with two ostrich feathers. “No. 5. A hat of yellow silk covered with black lace, a yellow ostrich feather in front. “No. 6. 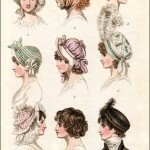 A cap of pink silk and net tied under the chin with pink ribbon, and covered the left side of the face. “No. 7. A morning bonnet of straw of chip. “No. 8. A cap of white lace with a bunch of roses in front.